If your looking for a quick and easy recipe than your in the right spot! 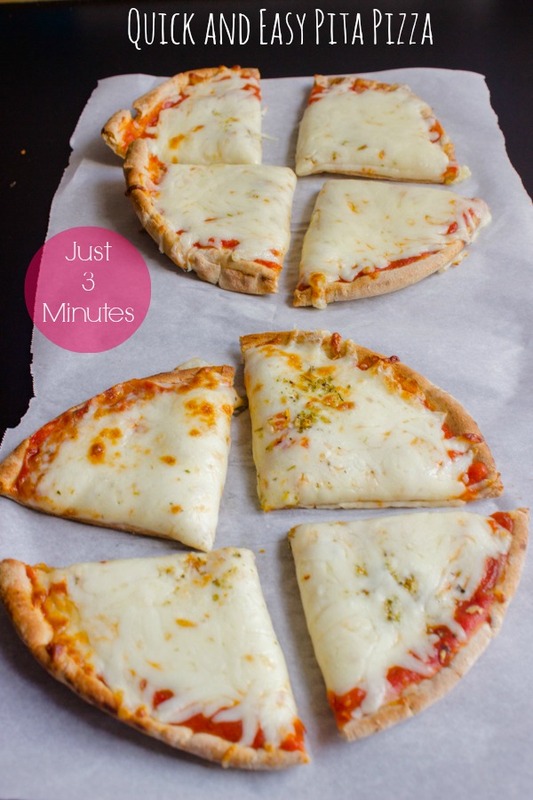 I’m going to share a little secret with you today..
How do you like the idea of a 3 minute pizza? kinda crazy right! but it’s true. This pizza recipe has been in the family for years. Originally, my mom would use the big homemade pitas for the crust, but When I got married I didn’t have the big homemade pitas. I started using the store bought pitas instead and they were worked perfectly! Years ago it was very hard to find pita bread in a supermarket, I had to get them at the Middle-Eastern grocery stores but now you can find them in just about any local supermarket. I usually buy a few packs and store them in the freezer; they can last for months in there. This recipe comes in handy when you are looking for a to make something quick and easy. I used whole wheat pitas but you can use white or whole wheat. The crispy crust and gooey cheese is delicious. 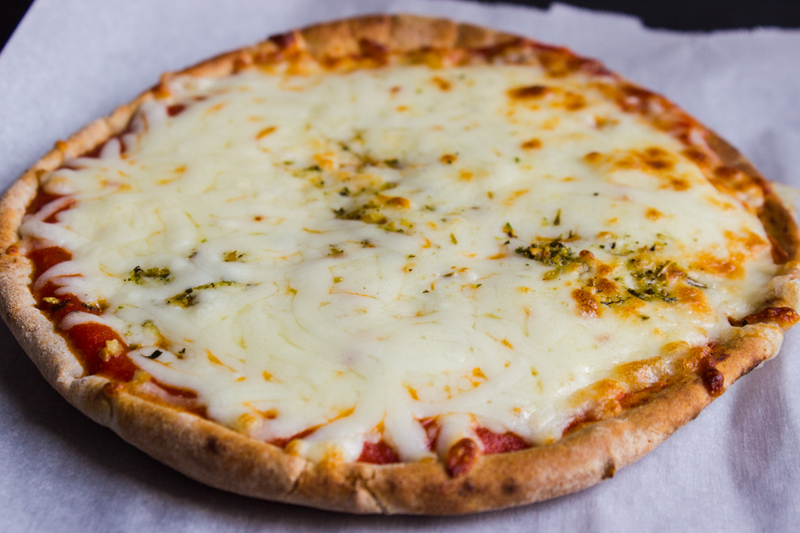 For a basic pizza you will only need 3 ingredients-pita-bread, marinara sauce, and cheese of course. 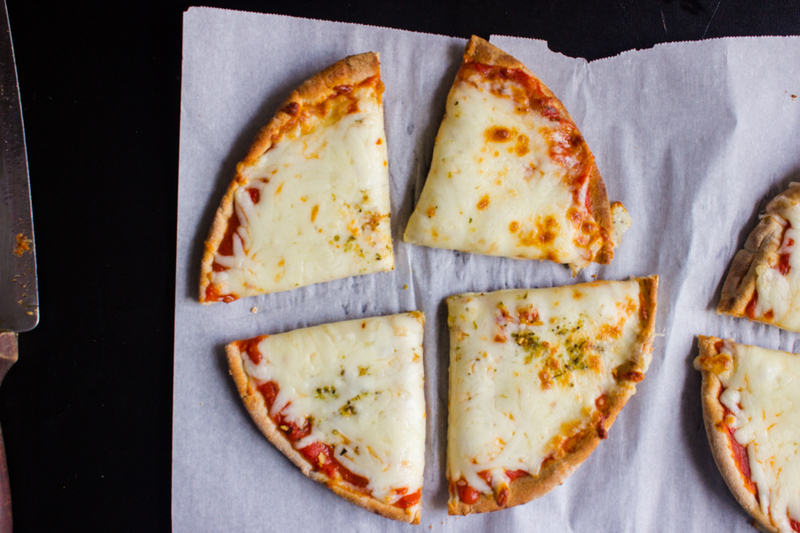 you can make the pizza in the oven or in a toaster oven. If your making them in a toaster oven you should be able to make two at a time. I posted the recipe for 2 pita pizza's but if you need more, just double or even triple the recipe. If making the pizza in the oven, preheat oven by turning on the broiler and adjust the rack to the middle. If in the toaster oven turn on the toaster to "toast". Place two pitas on a metal pan. Spread half the marinara mixture ( about 2 tablespoons) on one pita and the rest on the other. Sprinkle the cheese evenly over both pitas leaving about 1/2 inch for the crust. Place pitas in the oven for 2-3 minutes. Check on them every minute to make sure they don't burn. What temperature should the broiler be set to? What temperature do you set the broiler to? I’ve just tried pita pizza from a local pizza place, tonight. Was ASTONISHED by not just how good it was, but how “filling” it was. Think it has become my favorite, quick dinner and your website has given me the courage to try it at home. Your pizza looks delicious and not so very different from what I ordered tonight. 🙂 God bless. Glad you found the recipe helpful, Marie. It sure is good for a fraction of the price! Great recipe! I was wondering if you have ever tried freezing these and reheating them? I’d love to pack these for my girl’s school lunches but I’m worried the texture wouldn’t be right. What do you think? Earth, you can explore Rome as it appeared in 320 A.
Woah this website is a plus everyone loves reading you. Keep in the excellent get the job done! You already know, many people are searching all around because of this info, you may support them drastically. Wow, could this be any easier? I love this! Definitely going to become one of the weeknight dinner regulars at my house! I was planned to make this for lunch later today with the one leftover pita I have sitting in the fridge- and after seeing this post I can’t wait to make it! I’m going to add chicken sausage, spinach and goat cheese as toppings, yum! I can imagine how nice and thin the pizza would be with a tortilla crust! Such a smart, quick weeknight dinner idea! And so easy to build all different sorts of flavor combos using pita as your base! Yes, it’s perfect for quick weeknight dinners! Great! I’m sure your going to enjoy making them! This looks so delish! I want this!! These are so cute and perfect for a quick dinner! I’m glad to see you put lots of cheese on this, because it is delicious! Yea love Tons of cheese!! 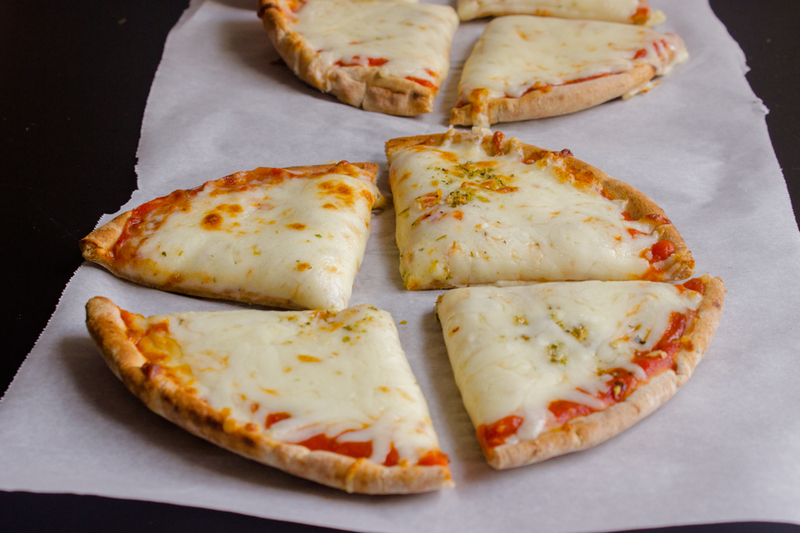 I love pita pizzas! They’re so much faster to throw together than making your own dough and rolling it out and such. I’ve also used naan bread before too, which is great if you like a crust that is a tad bit thicker. Hurray for super fast dinners! eeee! 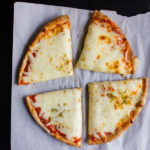 I love these cute lil pizzas-and they’re so easy! Yum!